Sitting on a plane bound for the American Medical Women’s Association meeting, I struck up a wonderful conversation with the man next to me. A PhD in English and master’s degree in counseling preceded his law degree, which led to an impressive career – he was on his way to meet a prominent journalist to discuss humanitarian crises. When asked why I was traveling, I mentioned that I would be speaking on the Impostor Syndrome. “What’s that?” he asked. I explained it’s the belief many successful people have that they’re a fraud and are just faking their competence. His eyes widened. With a sense of shock, he replied that he has felt that way himself. I wasn’t surprised, as up to 70% of successful people admit to feeling like an impostor at some time in their life. If we’re so accomplished, why do so many of us feel like a fraud? There are many reasons why successful people don’t “own” their success and attribute it to luck, charm, or their ability to fool others. Messages during childhood can contribute. If you were labeled “the smart one” by your parents, you may believe you’re not the person your parents thought you were – you’re a fake – if you make a mistake or don’t master every subject. Gender, race and nationality stereotypes can play a role in diminishing a person’s sense of belonging and competence. Certain environments feed self-doubt. Upon returning to academia, we were asked for feedback on a session in which we were to facilitate discussion of multiple videos about communication difficulties. I explained that I found it challenging to decide whether to limit the discussion on each video in order to play them all, or let the discussion go to deeper levels of understanding and skip some videos. Another instructor wrote back, “I managed my time perfectly.” With messages like that, it’s easy to feel we’re not as good as our peers. 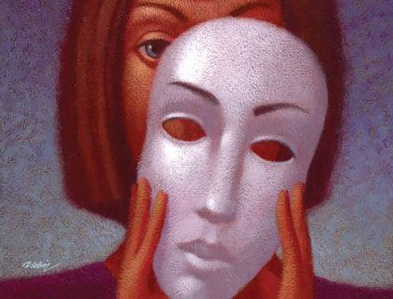 Among the most important factors in creating impostor feelings is our own definition of competence. Some people feel they must be perfect in order to feel competent. As Julia Cameron, author of The Artist’s Way, explains, “Perfectionism is not a quest for the best. It is a pursuit of the worst in ourselves, the part that tells us that nothing we do will ever be good enough.” In her wonderful book on the impostor syndrome, The Secret Thoughts of Successful Women, Dr. Valerie Young suggests we seek GEQ – good enough quality – not perfection. Other “impostors” feel that competence requires that we succeed effortlessly and do it all on our own. Most things in life require effort and assistance. Better to appreciate ourselves for what we’re learning and our ability to enlist others to get a job done. Knowing how common these feelings are can help us neutralize them when they occur. “There I am having those impostor feelings again!” we can remind ourselves. Challenging our definition of competence and finding a more realistic one is another good strategy. Finally, when we do succeed at something, we can consider what qualities in ourselves contributed. By acknowledging our skills and abilities, we can accept that it is us and not an impostor that creates our successes. This entry was posted in Doctor Coach, physician burnout, physician coach, physician coaching, physician fulfillment and tagged Impostor syndrome, leadership, medical career, perfectionism, Valerie Young. Bookmark the permalink. Thank you! I’m glad the site is interesting to you. My goal is to help people see a different perspective and open up more possibilities for their lives.